The country’s number one cable channel, Cinema One, is treating its viewers to “The Outrage” which is airing for the first time on Philippine television this Sunday (March 9). “The Outrage” stars Eurasian Thai actor Mario Maurer who, with his vast range of projects done, has gained widespread popularity in the Philippines. Maurer had also recently starred in Philippine cinema in the movie “Suddenly It’s Magic,” a Star Cinema production, where he starred alongside Erich Gonzales under the wing of director Rory Quintos. 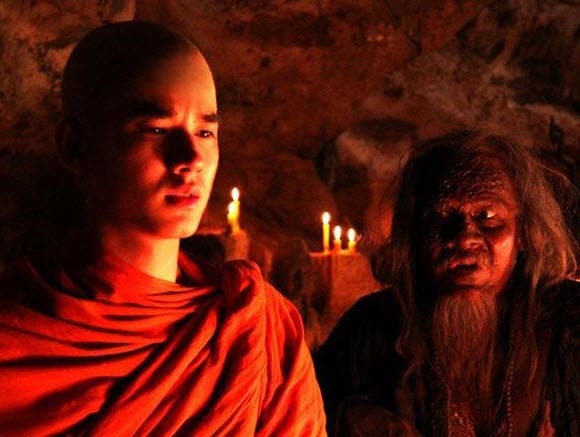 In “The Outrage,” Maurer plays a monk named Anont in a story of crime and mystery set during Thailand’s Lanna period. It details the story of a bandit who is convicted of murdering a warlord. Anont had testified during the bandit’s trial, but was unnerved by the turnout of the case. He chooses to leave the monkhood, and on his journey, he meets a woodcutter and a thief—a crossing of paths that coincidentally unravels the truth through a series of flashbacks. It turns out that nothing was what it seemed to be, nor was anybody whom they appeared to be. “The Outrage” is an adaptation of acclaimed director and writer Akira Kurosawa’s “Rashomon,” and also stars Ananda Everingham, Chermarn Boonyasak, Dom Heatrakul, Petchtai Wongkamlao, Laila Boonyasak, and Pongpat Wachibunjong. Film festival critic Amos Tan of thisfilmfest.com said of “the Outrage” that it “features stellar art direction and cinematography.” Furthermore, he remarked that “The Outrage” contains “solid performances and an unexpected narrative that will hold your attention from the first frame to the last”. The film also received much recognition, winning two awards in the Thailand National Film Association Awards for Best Visual Effects and Best Costume Design, with seven nominations for Best Make-up, Best Art Direction, Best Score, Best Supporting Actress, and Best Cinematography. Apart from these, the film had two nominations in the Asian Film Awards, where Mario Maurer was nominated for Best Supporting Actor and designer Noppadon Techo was nominated for Best Costume Design. Follow Anont’s journey and watch the truth be unveiled as “The Outrage” airs on Cinema One(SkyCable channel 56) this Sunday at 8:00pm. For updates, visit and like Cinema One on Facebook (www.facebook.com/Cinema1Channel).